Beautiful engraved certificate from the Consolidated Rolling Stock Company issued in 1904. 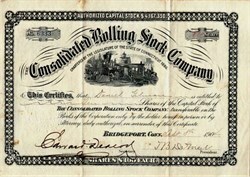 This historic document was printed by the A.S. Bodine Company, Bridgeport, Connecticut and has an ornate border around it with a vignette of train passing a station. This item has the signatures of the Company’s President, J.B. DeMeir and Secretary, Edward Deacon. The Consolidated Rolling Stock Company of Bridgejaort owned many thousand freight cars, and maintained three shops, located in the west, for the building and repair of its rolling stock. These shops are under the management of Edward Deacon, who acts as purchasing agent and superintendent for the com- pany. Edward Deacon was born in England in 1840, descended from an old Bedfordshire family of that name. He completed his education at Liverpool College; Very Reverend Dean Howson (now Bishop of Chester), Principal. Shortly afterwards he came to this country with other older members of the family, who settled in Howard county, Iowa. Leaving the farm he entered mercantile life in 1864, in the service of Captain "Diamond Jo" Reynolds of Mississippi steamboat fame, in his then immense grain and pork business at McGregor, Iowa, and soon proved himself so capable that large financial interests were entrusted to his care. Subsequently he assisted in the construction of the Milwaukee & St. Paul Railroad in 1866-7, being paymaster for the contractors, Judge Greene of Iowa, Alexander Mitchell of Milwaukee, and Russell Sage of New York. In this capacity it became his duty to purchase and pay for large supplies for the army of men and horses, which was strung along the unbroken prairie, at that time almost entirely unsettled and unknown. With one attendant and well armed, he would drive over the prairies from section to section between Austin, Minn., and Ossian, Iowa, carrying forty to fifty thousand dollars, paying the men by day upon the estimates of the engineers, and sleeping at night in the tents and shanties of the workmen with his cash box under his head. In 1868 he started for himself in the wholesale agricultural implement business, with headquarters at McGregor, Iowa, and established agencies for the sale of threshers and reapers in nearly every county of southern Minnesota, northern Iowa, and western Wisconsin. In this he was fairly successful, but the hard times in the West antecedent to the panic of 1873 compelled him to close up his business and remove to Detroit, Mich., where he married and accepted a position in the First National Bank of that city. A few years later he engaged with the great seed house of D. M. Ferry & Co., in which he became a stockholder, and remained with them several years. 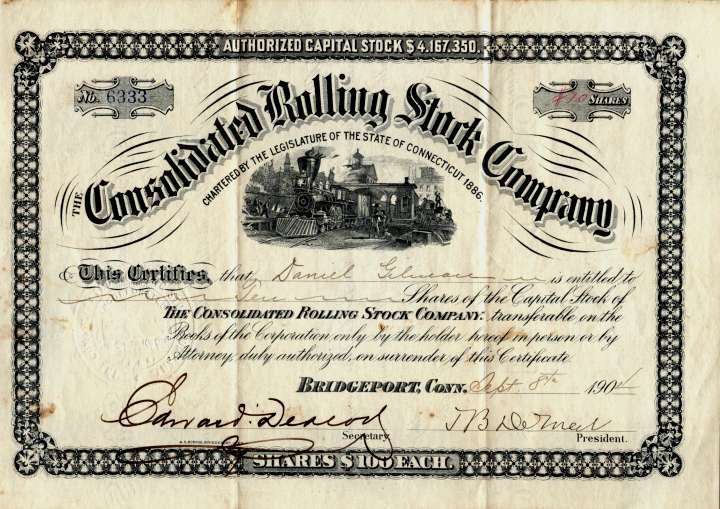 Having had some previous knowledge of the rolling stock business, upon the organization of the Consolidated Rolling Stock Company of Bridgeport Mr. Deacon was tendered the office of secretary of the company, which he accepted and removed with his family to that city in 1886. This company, whose capital stock is $4,000,000 (four millions), owns many thousand freight cars, and maintains three shops, located in the west, for the building and repair of its rolling stock. These shops are under the management of Mr. Deacon, who acts as purchasing agent and superintendent for the company. Mr. Deacon is a director of the Detroit Rolling Stock and other similar companies. He married, in Detroit, Miss Eliza Stoddard, daughter of Rodman Stoddard of Connecticut, the fifth in descent from Rev. Solomon Stoddard, the first librarian of Harvard College, who was grandfather of the celebrated Jonathan Edwards, and was also the ancestor of Aaron Burr and General W. T. Sherman. The result of this union is a son and daughter, who are both living. Mr. Deacon has neither sought nor held public office, his tastes rather inclining to a literary turn. He is the possessor of a fairly well filled library, and enjoys the privileges which membership in the Fairfield County Historical Society and the Bridgeport Scientific Society brings to him. He is a member of the Presbyterian church and a republican.